Clear Health Analytics | Is Copay Assistance Over? Will pharmaceutical companies continue to offer copay assistance as prescription benefits change? A trend that is attracting growing concern is that of insurance companies changing pharmacy benefits in a way that significantly affects the affordability of prescription drugs for patients utilizing copay assistance programs. In these cases, when a patient uses a copay assistance card to help offset their specialty medication’s out-of-pocket costs, the money the pharmaceutical company pays will not go toward the patient’s pharma deductible. The new program is called copay accumulator, and its increasing use in health plans is widely viewed as controversial. 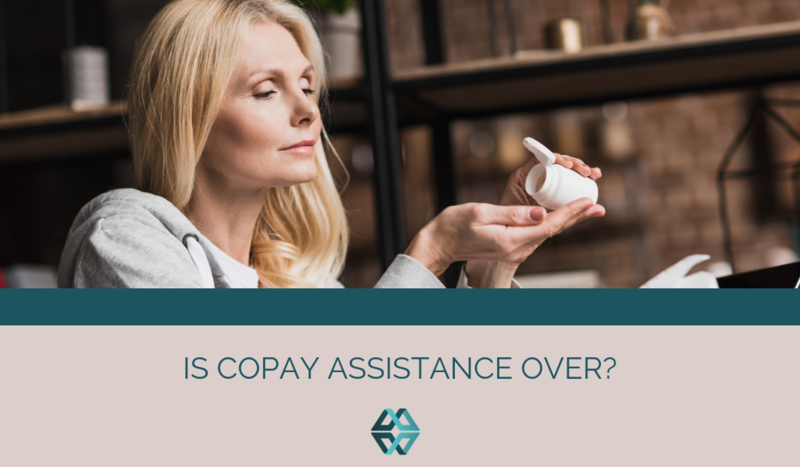 In this situation, does it make fiscal sense for pharmaceutical companies to continue to offer copay assistance? How will this affect patient access to specialty prescriptions, which are often costly? Health insurance companies are making changes that directly affect the out-of-pocket costs on medications for consumers. This new “benefit” is called copay accumulator – and it’s controversial. Whereas before, patients taking specialty drugs could use a copay assistance program from a drug manufacturer to offset medication costs, and the coupons provided to them went towards their deductible. But that’s no longer the case for some health plans and patients are concerned. “It seems unfair,” Mary Hawley told the L.A. Times in April. Hawley is one of millions of Americans that rely on copay assistance programs in order to be able to afford the cost of a specialty medication she takes for rheumatoid arthritis. “It shouldn’t matter to them who’s paying my deductible, as long as it’s being paid.” Suddenly, with copay accumulator add-ons, many patients will have to spend more out-of-pocket to obtain their medication than before. It seems that patients are caught between insurers and pharmaceutical companies who are each seeking to alleviate the high costs of specialty prescription drugs. Last year, California’s governor signed into law a bill that prohibits pharmaceutical companies from offering discounts or co-pay assistance if a cheaper alternative is available. Some limitations exist, but for the most part this law seeks to control prescription drug costs. Opponents of co-pay assistance programs believe that they don’t help control what they view as the root issue: overpriced drug costs. Furthermore, there’s a need to treat everyone in a health plan same, says Brian Marcotte, president and CEO of the National Business Group on Health (NBGH). NPR reports that NBGH conducted a survey in which 56% of employers say they are considering copay accumulator programs in 2019 or 2020. The major problem with copay accumulator stipulations is that they make necessary medications unreachable for patients, say medical advocates. They argue that in many conditions, no generic alternative exists or that only a specific medication works. Such is the case for patients like Kristen Catton, who after trying other drugs to treat her MS found only one that works. The drug, Gilenya, has almost completely controlled her symptoms and allowed her to return to work part-time. But now, her health plan has a copay accumulator program. Her out-of-pocket costs skyrocketed to $3,800/month, something she says is not affordable for her family. Copay accumulator programs are often not clearly communicated with patients, says AIDS advocate Carl Schmid. PrEP drug users often rely on co-pay assistance in order to afford medications that prevent HIV. Schmid says that plan details aren’t user-friendly and that he sees patients who don’t learn about out-of-pocket costs for their prescription drugs until they are billed. “Then they’re stuck,” says Schmid. AS COPAY ACCUMULATOR PROGRAMS RISE, WILL COPAY ASSISTANCE SUFFER? Nearly 20% of specialty drug users in 2016 relied on copay assistance programs in order to obtain their medication. As pharmacy benefits shift and more costs are put on patients, will copay assistance survive? If the goal of copay accumulator programs is to save payers money, then it’s too soon to tell says Managed Care Magazine. It is anticipated that pharmaceutical companies will continue to develop payment assistance programs that “avoid detection by payers.” Given increased employer interest in copay accumulators, it seems the new program is “here to stay” according to Benjamin Slen, Vice President of Product Development at Express Scripts. In their “Specialty Pharmacy Podcast,” CSI Group recently explored how copay assistance programs are likely to be affected by copay accumulator programs. It’s much too soon to tell the true fall-out of copay accumulators, but providers, drug manufacturers, and advocates are concerned that patients will simply stop taking their prescribed medications. The Medical Society of Virginia is, as one example, so concerned about copay accumulator programs that they have urged the Virginia State Corporation Commission Bureau of Insurance to “undertake an investigation into Healthcare Insurance Copay Accumulator programs to ensure patients can afford their medications,” noting the issues and risks said programs pose to patients with rare and chronic diseases. Greater responsibility doesn’t have to be limited to increased cost-share. If providers, who have the most-direct relationship with patients in the healthcare continuum, change their approach then the potentially devasting effects of reduced copay assistance can be somewhat mitigated. In particular, providers can learn more about health plan policies and their patients who are affected by them. Costs are often hard to pinpoint for prescriptions, but out-of-pocket cost estimators are a way that patients can help plan for accurate out-of-pocket costs. In the case of Daizy, Clear Health Analytics’ advanced formulary tool, accurate nationwide data is utilized to ensure that patients are able to correctly anticipate the costs of their medications, month by month. The most advisable path forward to prescription affordability is by focusing on patients. Costs are a concern when it comes to accessing specialty drugs. If copay assistance programs fade or even become illegal in some states, arming patients with information on medication costs becomes increasingly important. That’s why pharmaceutical companies are partnering with medical advocacy groups to sponsor advanced formulary tools. These tools can factor in complex information to arm patients with the information they need to continue taking their much-needed medications. The Clear Health Analytics award-winning advanced formulary allows people to compare health plans based on out-of-pocket prescription costs. Ask Daizy how it can be customized for specific medications, including co-pay assistance. Don’t worry about health insurers. They’re doing just fine under the ACA. Are High-Deductible Health Plans a Good Idea? © Copyright 2018, Clear Health Analytics | All rights reserved.